This handmade card is just one of many Mothers Day card ideas that came to my head. 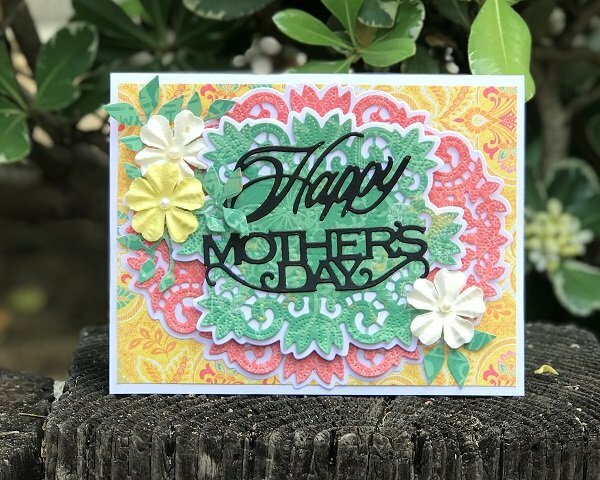 It's a colorful example of how you can use dies and paper flower stickers to make a beautiful Mothers Day card. 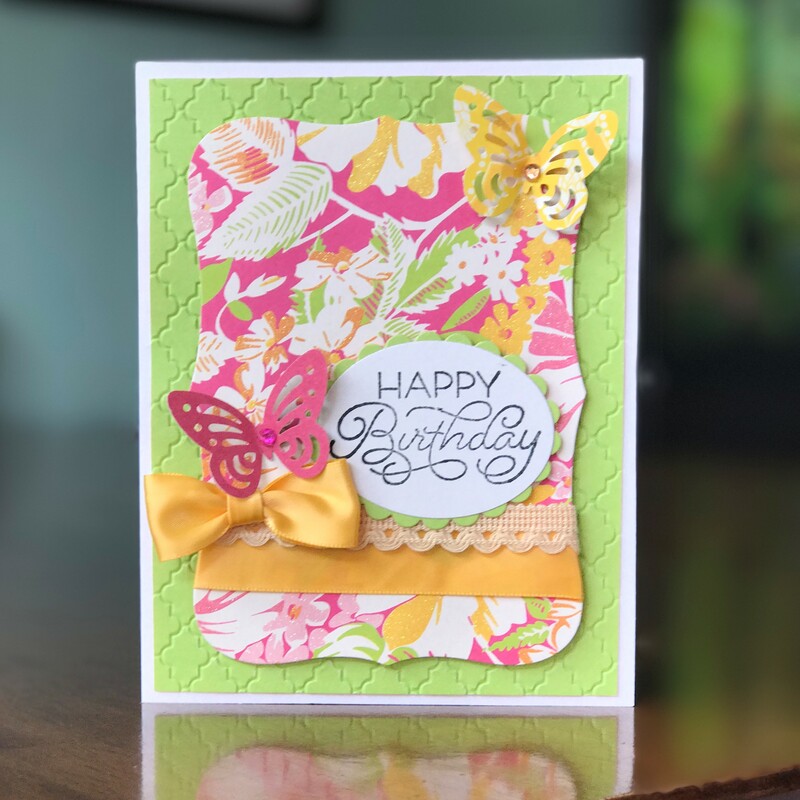 Anna Griffin has some of the most beautiful dies and I've used a couple of her sets in this card. The paper comes from a scrapbook pad that had several prints in the stack. The brand is K & Company but I don't have the exact name of the paper pad. 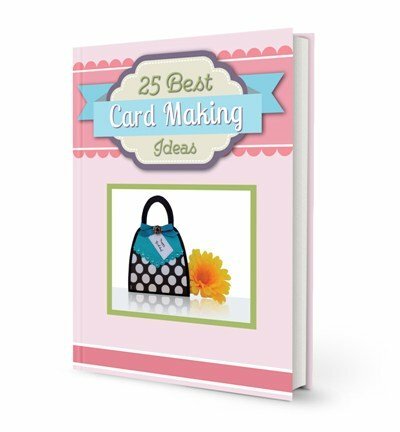 Gems, pearls, glitter and stickers can help embellish your card so experiment with all kinds of toppers. Spring is the time for Mothers Day and for my handmade card ideas, I often like to use pastels. There are so many beautiful prints to make a Mothers Day card. 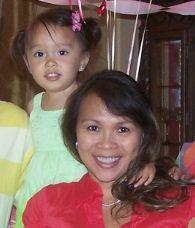 I chose one with pink, cream and green for the card below. I used the green to border the card and pink to break the print up a bit. 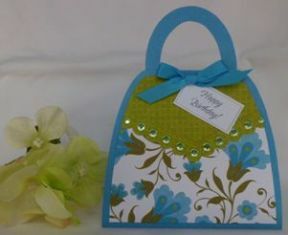 For this handmade card making project, I used a decorative border, circle and scallop circle punch. You can also use border dies or circle and scallop dies. I just happen to have punches at the time I made this card. 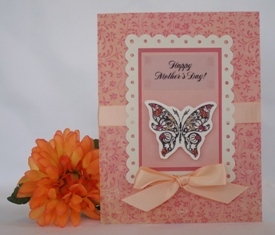 I love making handmade Mothers Day cards because I get to use pretty pattern paper and beautiful stamps. I was able to use this peach print for this card. I thought it was subtle enough and didn't overpower the butterfly sticker. 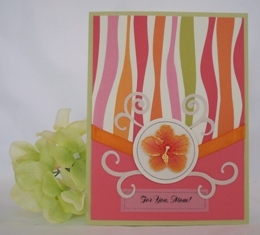 Try bold colors to create Mothers Day cards. I found this pattern paper that had bright colors so I incorporated it for my card. I printed the sentiment on vellum paper and added a bright flower sticker. You can't go wrong when you pick a pretty floral print to make a Mothers Day card. I created the sentiment design on my computer and added gems and a flower sticker. I used my 1/2" corner punch around the sentiment and added a satin bow. A simple Mothers Day Card idea using a floral print, adhesive gems and a fabric flower. 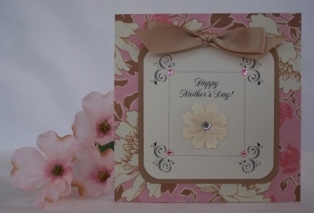 A pretty Mothers Day homemade card idea using a tan and pink floral print. 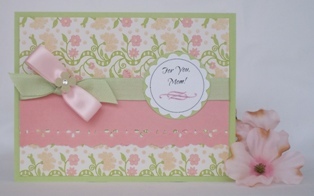 Ribbon, adhesive gems a cream flower embellish this card. 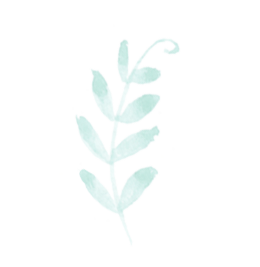 A teal and floral print greeting card idea for Mothers Day. The sentiment is printed from vellum and embellished with glittery brads.